Prostate cancer and other health concerns are topics I’ll address head-on during August, which is turning out to be a busy month for me in the media. 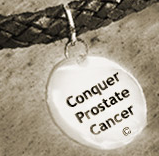 Recently I pre-recorded a broadcast on coping with prostate cancer. Joining me was a urologist in Maine. As you’ll hear for yourself when you join me, the doc and I agreed on ALMOST everything! That joint interview will be aired on three radio stations in Maine at the end of this month (August) and throughout September. Also this month I’m getting ready to video-record a motivational speech which I’ll deliver “live” online on the last Thursday night of August (Aug. 26th 7 pm). That webinar will give me a chance to present my thoughts on "redesigning your life" for better health. I refer not only not only to prostate issues, but also to weight loss and other widespread health concerns. All this will happen in time for September as National Prostate Cancer Awareness Month, proclaimed annually by the White House. Stay tuned for further details at this blog and at my Twitter and Facebook pages.